Being a farmer can get emotional. In a short amount of time you become very attached to the animals and even the plants – good to know I have some sort of maternal instinct I guess. If people heard how much I talk to the animals my sanity would be questioned. So when the task of tagging cows came up in Ravenshoe, I was slightly horrified and seriously apprehensive about helping out. But, I’m trying to maintain the outlook that if I’m okay eating the meat, I better be okay with the process of farming the meat. 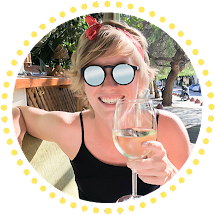 And even though I had to sit on the sidelines for a few minutes watching everything from afar, I eventually overcame my horror and was able to help out. In order to tag the cow’s ear, the head has to be restrained so they don’t thrash around, leading to the tag being ripped through the ear. Uh huh, that's what was at stake. I could potentially slash the cow’s ear apart. So to get the cows slightly stationary they have to walk through the livestock crush – seriously who named this!? – and they walk towards the exit which has a triangle shaped opening at the end of the narrow stall. Once the cow reaches the exit you have to slam the gate closed, making the triangle opening small enough to trap the cow’s head. It’s no surprise the cows don’t like the crush so they tend to head straight towards to the exit when they enter, meaning the whole process is quick. When the first several cows were tagged, I audibly gasped when they slammed the gate closed around its head. It was so quick and the metal banging together was so loud. I thought I was going to cry right there in front of two cowboys, thinking this constituted torture. Unfortunately this is a part of farming and it has to be done - and in the end, the cows are fine. The tags are associated with each farmers’ property TIN and are used to track ownership until the meat or dairy product goes to market. In the event the cow product doesn’t meet government standards, it’s tracked all the way back down the line to find out at which step the quality went south. And a more practical use, the tags are used to identify cows in the event they make a mad dash for the neighbor’s field and you need to claim it. So once my initial shock wore off and I realized not every cow was whining or trying to break down the crush I was able to help out. I started by operating the back gate, making sure to close it behind the cows so they had no other way but forward, towards the head clamp gate. As soon as the cow realizes it’s a trap, it immediately tries to back out of the crush and you have to try and stop that. Otherwise, you have a cow dancing around you and it’ll take forever to move them all through the crush once one has escaped and put all the others into a panic. 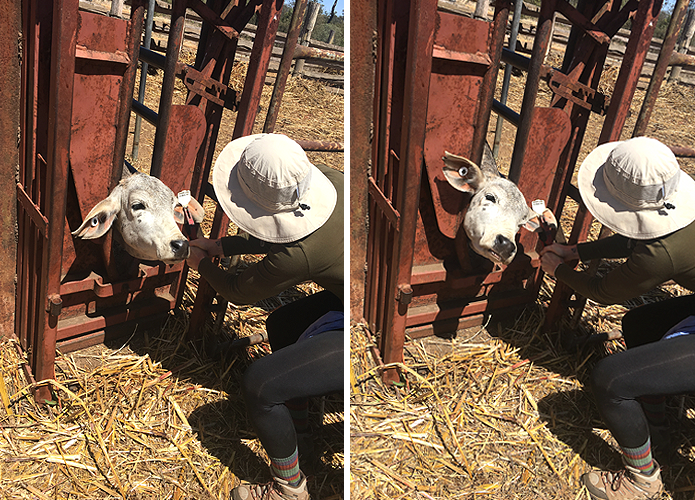 After a few minutes operating the gate, I was ready to try my first ear piercing. I apologized to the cow numerous times before and afterward. The piercer looks like a big pair of pliers with a nail tip on the inside. You slide the front and back pieces of the tag into the pliers and squeeze real hard. I imagine it isn’t any different than a piercing gun used to pierce human ears, except that you have to clamp it shut yourself. 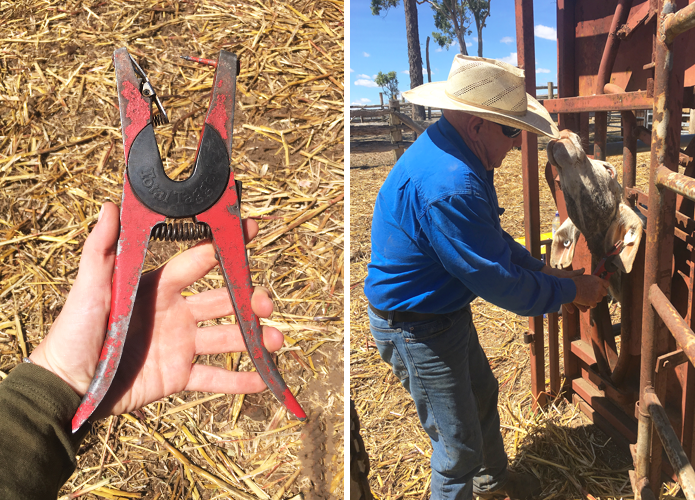 The tricky part is placing the clamp around the ear and getting it done before the cow starts moving its head. For people who do this for a living, it isn’t difficult because they can manage the pliers with one hand. I, on the other hand, had to use two hands and all my strength to get those pliers closed. So I definitely had to be quick about it because I wasn't using one hand to hold the ear in place. I managed to do a handful of cows and luckily didn’t leave any cows with ear gauges. And once the initial sting was over the cows settled down and the triangle gate was opened so the cows could go back to the main paddock. On more than one occasion, the cow tried to jump out while the gate was half open, and others took off like a bat out of hell, initially leading me to believe they were extremely traumatized by the piercing. But after they joined the rest of the herd all the cows seemed fine – which made me change my assumption, and I know think cows over analyze situations just like humans. And they probably get worked up over the crush for no reason. Cows... they’re just like us!